All backpackers are gear heads, I’m sorry but it’s true. The first time you get wet, or cold or something fails you begin to look for a solution to the problem, sometimes it’s technique but usually it leads to better equipment. My ties to the equipment industry go somewhat deeper. When I lived in Houston in the early 70’s I was fortunate enough to work for, at the time, the 10th largest backpacking store in the country, Wilderness Equipment. This was at the heady early years of specialized equipment and Colin Fletcher‘s influence on all things walking. The beginnings of The North Face, Sierra Designs, Jansport, Vasque, etc. Mostly small companies turning out great and innovative equipment, who frequently consulted us on design. I also spent a short time as a factory rep traveling, selling and demonstrating several lines of canoes and kayaks as well as other equipment. Before that immersion it was the official Boy Scout catalog and R.E.I. (I became a member in 1970). It was also homemade or borrowed or Army surplus stuff as I was a kid with no money. That situation existed, really, until around the turn of the century when I began to have more time and a little more money and I made the concerted effort towards light and ultralight equipment and pack weights. I had always paid attention to equipment weights and carrying only what I thought I needed but usually ended up with more things than I really needed or even used and of “industrial” quality. In the fall of 2001 I began to really look at my list with a critical eye and to think about replacing much of my nearly 30 year old gear. Since that time I have reduced my base pack weight over 20 pounds, down to 10-12 pounds (not including food and water) depending on the season and the expected conditions. 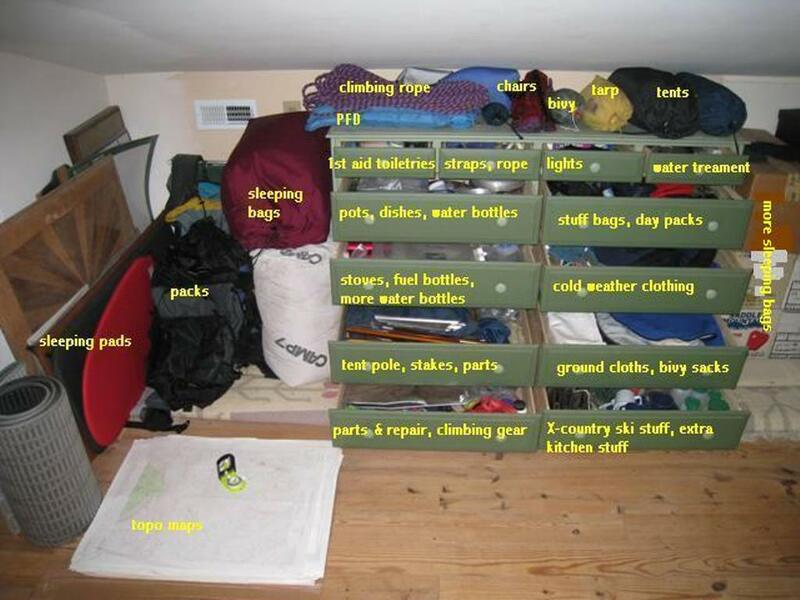 Some trip reports will have a gear list attached, especially longer trips and unusual conditions. Here is a general gear list for trips in the East, expecting temperatures above 20 degrees and wet conditions. I don’t have every piece of gear I have ever used but I do have a lot still hanging around.